CPR Educators is proud to be a leading provider of CPR certification, first aid, and AED training for people in Florence, SC. Our certified instructors share their considerable background in emergency services to make sure every student not only passes the certification assessment, but to also know how to apply the knowledge and skills to a real-life emergency. Many of our instructors also have careers as nurses, EMTs, firefighters, and physicians. Why Take CPR Classes in Florence? While the majority of us will never need to perform CPR or first aid, beyond tending to a minor injury or illness, everyone should have these life-saving skills, not just people in healthcare or first responders. The fact is, CPR and first aid save lives. Between the onset of an emergency such as a heart attack or car accident and first responders arriving to the scene, the victim’s condition could rapidly deteriorate, while administering CPR or first aid can lead to a much more positive outcome. CPR Educators’ classes go beyond teaching for an assessment. We seek to empower our students with real-world, applicable knowledge along with the confidence necessary to take action quickly. Whether it is a child you’re babysitting, a patient at your clinic, or even a stranger you’ve never met, you will have what it takes to step in when there is an emergency. At our Florence American Heart Association Authorized Training Center, we teach several emergency training certification classes, including OSHA-required courses and a pediatric CPR class. This course prepares Florence students in how to respond when there is a serious illness or injury in a baby, toddler, or child until help arrives and is designed specifically for child care workers. It’s also recommended for new parents. The Basic Life Support (BLS) CPR class instructs healthcare personnel and first responders including nurses, physicians, CNAs, and home health aides, in CPR and cardiovascular life support skills. Students learn one- and two-person lifesaving skills in addition to administering CPR in both healthcare and non-healthcare settings. For students with busy schedules or who prefer to learn on their own, this course teaches everything in BLS but is partially online. The classroom setting is only used for practical instruction and skills assessment. Students learn how to properly reduce risk and exposure of bloodborne pathogens in accordance of OSHA Standard 1910.1030. Students are trained how to OSHA 29 CFR 1910.157 requires fire extinguisher training in certain industries. We make sure students know how to competently and safely use a fire extinguisher. 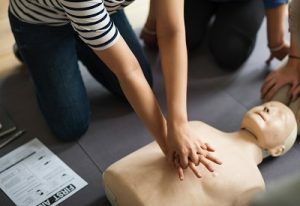 For businesses and organizations who want to offer their employees the convenience of on-site CPR classes, we will happily come to your place of business or worksite. With clients ranging from small businesses to large corporations, we still offer small classes that are fun, engaging, and can even be customized to your industry!